Are the linebackers going to be a reason for optimism or a reason for concern in 2018? Joe Dineen is one of the best linebackers in college football. No seriously, he is. The stats back it up. But who else will be running around with him this year cleaning up anyone who happens to get past Daniel Wise? With Kansas running mostly a 4-2-5 last year, I won’t project a two-deep, but just work through the top four or so guys and then take a look at the backups. With no official depth chart, this is just my prediction, so please, don’t report this as fact and then ask David Beaty about it. A team captain in 2017, Dineen was second team All-Big 12 while leading FBS in solo tackles per game and set a single-season school record with 25.0 tackles for loss. Dineen has been starting since he was a sophomore but missed nine games in 2016 due to an injury. Loneker started all 12 games alongside Joe Dineen in 2017. Loneker actually transferred in from Baker University, sitting out 2015 as a redshirt season before starting four games and playing in all 12 in 2016. Ogbebor has been contributing on the field since his freshman year of 2015, where he played mostly special teams. 2016 saw him see playing time in six contests before getting into all 12 games of 2017. He was one of six Jayhawks with 2.0 or more sacks in 2017. A graduate transfer from VMI, he lettered all four years and led the Southern Conference in tackles for loss and sacks in 2016 before being named second team All-Conference in 2017. He is a cousin of former KU running back Brandon McAnderson. Well, I think there’s definitely some, although there isn’t much experience. Sophomores Kyron Johnson and Dru Prox will probably be first off the bench, and I wouldn’t be surprised if either (or both) made their way onto the two-deep as each saw their names appear there in 2017. Johnson played in all 12 games last year on defense and special teams, while Prox got in on seven games. JR Denzel Feaster redshirted in 2017 after getting regular playing time in the final eight games of 2016. That said, he didn’t really see a lot of PT and only registered 8 tackles that year. Freshman Kenny Bastida had a rather impressive offer list, but the rest of the freshman are mostly two-star recruits who haven’t had a chance to show us what they can do yet. Those names include Cooper Root, Jay Dineen, Nick Channel, and John Lillig. The position coach for the linebacking corps is Bill Miller, who is back for his second stint as an assistant in Lawrence. Miller has spent the last four years as the linebacker coach at Florida State. Miller served one year at Kansas, 2009, under Mark Mangino. Joe Dineen is one of the best linebackers in the country, and the top of the depth chart does have some experience and some decently talented guys. However, as you can see, the top of the depth chart is very senior heavy. 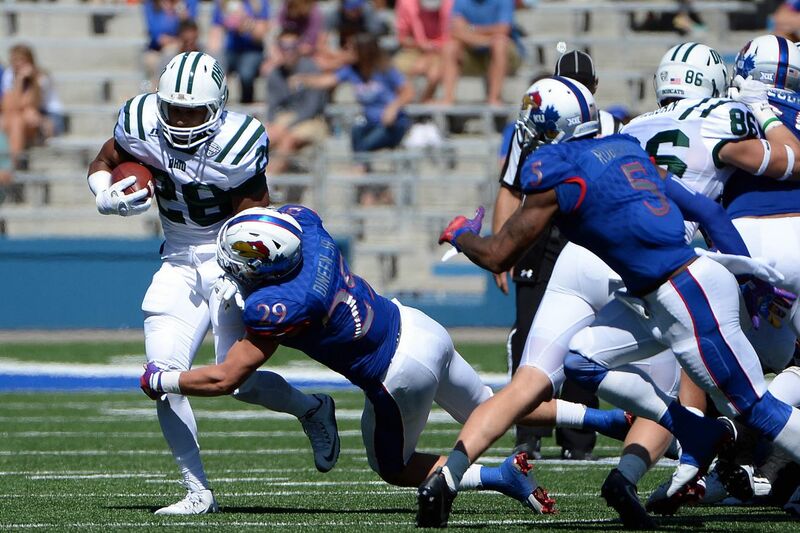 The Jayhawks will have to figure out how to develop the younger guys behind these seniors, but for 2017, the linebackers should be a capable unit for Kansas.